Spotted in a Nuneaton shop window by Peter, the cruising owner of NB Gecko. 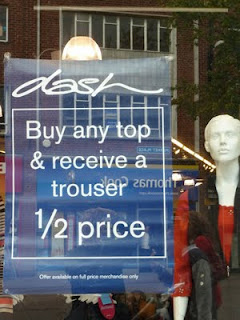 May as well pay the full price and receive a far more useful pair of trousers. Not that I ever watched their TV programmes, you understand, but I have a feeling that Trinny and Susannah had a tendency to refer to 'a trouser' in the singular, rather than using the more commonplace plural 'a pair of' form. I suspect 'a trouser' therefore may not actually be a typo, but could instead be a rather affected way of referring to what we used to simply call kecks. You're right, Jon. The word itself isn't a typo. But a trouser for half price just made me laugh and think that maybe for twice the price you'd get twice the trouser. Dear Trinny. Poor Susannah. But yeah, I know where you're coming from. However, while we're pulling apart the Dash point-of-sale material, what's with the 'receive a trouser'? Are they too posh for the word 'get'? The very phrase 'receive a trouser' does make me want to snigger in a horribly schoolboy-ish way. Is it just me, or does it sound a bit, well, smutty? No, not just you. Me too.